Popular file sharing web site depositfiles.com use nginx web server. I don’t find much download links from this site, most of the links i found are from rapidshare. But this one is getting popular and already have an Alexa Rank of 144. Most file hosting sites do not use Apache as it use too much resources. 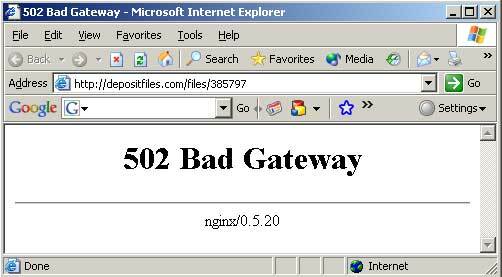 nginx is a light weight web server + reverse proxy. I first read about this in blog of fastmail.fm which use nginx as proxy for their mail servers. As per the web site nginx is popular in Russia. I have not tryed this web server yet. I use lighttpd, which is a light weight web server for our free file hosting at http://uploads.bizhat.com along with mod_secdownload, which prevent hot linking of files. Download link expires after a time set by you. Posted in File Sharing. Bookmark the permalink.